You are currently browsing the Franklin Foods Blog blog archives for July, 2010. On Friday June 4th, I had the honor of being an invited guest to the White House to help roll out Chefs Move to Schools, the newest program developed as part of Michelle Obama’s Let’s Move Campaign. Joining me for this wonderful adventure were 30 of my collegues from CT including Tagan Engel (pictured with me). Share Our Strength, the nation’s leading organization to ensure that no kid grows up hungry, was tasked to recruit and engage several hundred chefs from across the country to lend support to this new program that will surely change the life of children for years to come. The day started, like most days do by consuming a healthy breakfast, this breakfast however was a bit different. Paired nicely with the meal was a breakfast symposium organized by Share Our Strength; Healthy Schools, Healthy Kids: How Chefs Can Make a Difference. The program was chockfull of great information to not only engage chefs with Chefs Move to Schools but also to alert chefs to the growing issues related to both childhood hunger and obesity. This breakfast was eye-opening for many chefs in the room who may have been oblivious to the epidemic facing the children of our wealthy country. 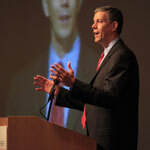 Through the words of Janet McLaughlin, the rock-star Director of Operation Frontline; Billy Shore, Founder of Share Our Strength; Secretary of Education Arne Duncan (pictured); Janet Poppendieck, Professor of Sociology at Hunter College, City University of New York and author of Free for All: Fixing School Food in America; and White House Assistant Chef and Food Initiatives Coordinator Sam Kass chefs were reminded how important it is to engage children to make a difference. • Chef Andrew Nowak, volunteer at Steele Elementary in Denver, CO, accompanied by Gene Boyer, Principal of Steele Elementary. • Chef Bill Telepan, volunteer in New York City public schools, accompanied by Chef Jorge Collazo, Executive Chef of New York City schools. • Chef April Neujean, former volunteer and current Food and Nutrition Services Coordinator for the Edible Schoolyard New Orleans at Samuel J. Green Charter School. The panelists described their experiences working together; the good, the bad, but not too much of the ugly. There were quite a few laughs by the audience; this was certainly a relaxing and informative panel session. Next came, Ellen Teller, Director of Government Affairs at the Food Research and Action Center, who enlightened the crowd to the Child Nutrition Reauthorization Act that is pending in Congress. She explained to the guests in the room that everyone here and at home can make a difference in school meals by contacting your Congressman and expressing your desire to see real change. At 10:15 AM, we were dismissed from breakfast and paraded through the streets of our Nation’s Capitol to the sidewalk outside of the White House gate. The sea of white was something rarely seen in Washington, DC; with exception to the dumping of snow the city experienced this past winter. We, all 700 of us, waited patiently in the 90 degree heat to gain access to the south lawn of the White House. Upon entrance we were given a paper toque and directed to the White House garden. Walking the grounds you felt like you were in any other city park, except for the Secret Service Officers in black tactical gear carrying their high powered machine guns. While it may have caught a few chefs off guard, it relaxed me a bit. 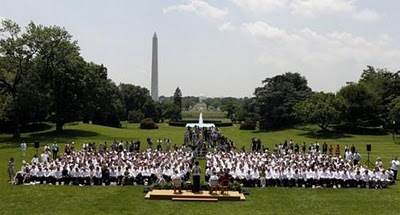 With all those chefs in one place at the same time, the ego level was higher than any other time ever at the White House; the presence of officers with machine guns was a welcome sight. Despite all the egos (us chefs have been known to feel like we are better than others…), when we were directed to proceed up the lawn to the chairs set up by the stage, we all proceeded in an orderly fashion. Many pictures were taken at this point, since we were only 20 yards from the majestic building. The chefs ranged from corporate chefs to restaurant chefs; School Nutrition Association was well represented by at least ten of us chefs including myself, Tony Geraci of Baltimore City Schools, Brad Trudeau of Dallas Independent School District , Tim Prosinki of Berlin, CT Schools and Danny Seymour of SNA; there were also quite a few top notch celebrity chefs: Aaron McCargo Jr, Cat Cora, Rachael Ray, Tom Colicchio, Marcus Samuelsson, Ellie Krieger, Susan Feniger, Mary Sue Milliken, Bryan Voltaggio, Monica Pope, Anne Burrell, Linton Hopkins, Marvin Woods, Jose Andres, Art Smith, Daniel Boulud and CT’s own Michael Nischan. After a brief wait, the doors to the White House opened and the First Lady, Michelle Obama, accompanied by Sam Kass, Chef Todd Gray of Equinox Restaurant and the local school principal he has been working with. Sam Kass introduced the First Lady and she spoke for about 15 minutes. The First Lady spoke about the connection between food and happiness. “So many good memories involve food,” she said. “You are all at the heart of this initiative because if anyone understands nutrition and food, it’s the folks sitting here in their whites today. You know more about food than almost anyone – other than the grandmas – and you’ve got the visibility and the enthusiasm to match that knowledge.” She talked about how many children go to school hungry and how school lunches were so crucial to their nutrition. “Let’s make salad bars fun,” she said with great enthusiasm. She urged us all to go home and find a school and make friends with the principal and teachers. “Bring them food, and they will welcome you.” She also spoke about encouraging Congress to pass the Child Nutrition Reauthorization Bill that is in Congress now and encouraged us to contact Congress. As the Marine Corp Brass Ensemble played; the First Lady exited stage right and made her way to the first row of chefs to greet them. When she got to me, she said “Thanks for all you do”, I responded “Thank you for all your support.” Before another breath could come out, she was gone, walking down the line, hurried by her press secretary and the Secret Service. Those five simple words she uttered will make a difference in the life of children. Knowing that the White House cares about the future of our children, does not make my job any easier, but it certainly offers the children a glimmer of hope.